Try to picture Texas 25 years ago. See, Texas had a litter problem. 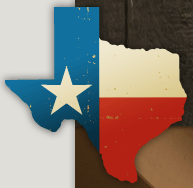 The Texas Highway Commission then said they'd had enough, and did something about it: they launched the “Don't Mess With Texas” campaign (DMWT). Though the slogan “Don't Mess With Texas” has been in use for almost 25 years, it remains very popular, and Texans take it very seriously. “Don't Mess With Texas” is an extensive public education campaign that informs Texans the importance of not littering. Every two years, the DMWT research team gathers all the litter they could find, and conduct surveys from thousands of Texans to find out their littering behaviors. After this research, DMWT then comes up with strategies that are specifically tailored to address the problem of littering. What they find every two years is: though roadside litter has lessened, half of Texans still admit to littering, and that if every litterer in Texas picks up just six pieces of trash every month, the highways would be clean. 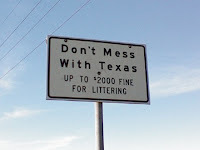 Littering in Texas is against the law (like in some other states) and an offender may be fined up to $500. If an offender repeats the offense, the fines may go up to as high as $2000 and 180 days in jail.